Rubber washers are flat rubber rings with center holes to accommodate fasteners or allow fluids to pass through. Rubber washers prevent leaks, protect surfaces, and dampen vibration in a variety of applications. Because of their durability and flexibility, these rubber spacers provide a tighter seal than metal washers in many applications. Rubber washer uses especially benefit plumbing, heating, ventilation, and air conditioning systems, as well as pools, boats, and other aquatic products that come into extensive contact with water. They also insulate against electric charges in electronic and thermal applications. Additionally, rubber washers absorb shock, making them great for use as rubber spacers in machinery with frequently moving parts. No matter the application, rubber washers’ nonabrasive qualities ensure scratch-free products throughout their lifetime. Rubber materials are used because of their high flexibility, pliability, and conformability to different surfaces. Silicone rubber washers: Silicone washers withstand extreme temperatures (̶150° to 500°F) in dry or humid climates, offering the best overall temperature range available. They also operate with low compression sets and resist ozone, UV light, and fungus. Silicone is the material of choice for brake fluids and high aniline point oils, but it doesn’t work well for petroleum oils and ketones. 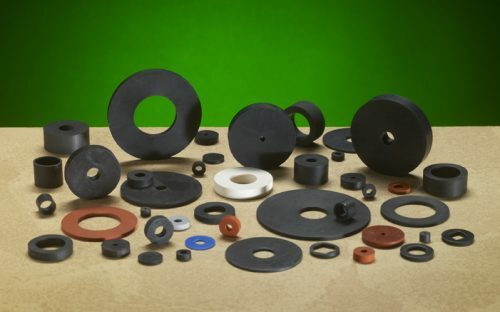 Ethylene propylene diene monomer (EPDM) rubber washers: These washers can withstand weather extremes and temperatures from ̶60° to 280°F. They also offer low gas permeability and resist ozone, steam, water, alcohols, and brake fluids. EPDM rubber washers have dielectric qualities, which provide excellent protection from electrical currents, ozone, and sunlight. It is heat resistant and has excellent color stability. Neoprene rubber washers: These washers weather well, have high ozone resistance, and good oil, petroleum, and solvent resistance. They operate in temperatures ranging from ̶65°F to 260°F. They also resist freons, high–aniline point oils, and mild acids. Neoprene rubber works well in general-purpose elastomer applications. You can buy stock sealing washers in small and large quantities, but it’s also possible to custom-design washers to your precise specifications. Manufacturers use rubber washers as spacers, springs, locking devices, and wear pads. They also support threaded fasteners, particularly in the construction industry. In compressors, they absorb vibration and seal fluid as well as liquid connections. They absorb shocks and insulate electric motors. Rubber washers assist in sealing applications that require flexibility such as machines, automotive parts, and household appliances. They’re also used in equipment that comes into contact with oils and petroleum. Industries that use rubber washers include construction, electrical and plumbing installation, along with aerospace and automotive manufacturers, appliance producers, and OEMs. Thomas A. Caserta has been manufacturing rubber washers for a variety of applications for more than 70 years. We can provide both stock and custom-designed washers depending on your project’s needs. Contact us today with your questions or to request a quote. We look forward to partnering with you for all your rubber washer and rubber spacer needs!